I feel good, bananana, I knew that I would now!!! Ok, I know it’s a little early to kill you all with my singing, but, seriously, that is how I feel this morning ~ awesome! I started off my day with a quick 30 minute interval walk/run on the treadmill, followed by 10 minutes of meditation and 15 minutes of sun salutations yoga. I lit my Mandarin Orange Aroma Oils and my NEW Calming Seas CD and it was perfect. When I was all done, I was completly calm, relaxed and ready to start my day. 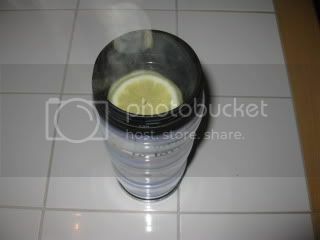 This morning I took my big container of hot lemon water to go on my drive this morning. By the time I got into work, I was starving and ready for breakfast. I am trying to not eat breakfast too early since I do not technically get a mid morning snack. Today’s breakfast was OUTSTANDING!!! 4 raspberries – for color! AMAZING!! 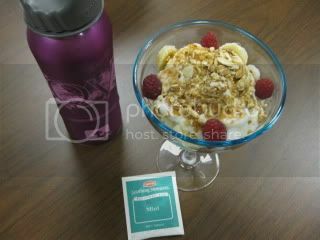 I savored EVERY bite of this 3 Weight Watcher Point breakfast – sooo good! I also picked out a tea from my Tea Bag Swap to have after breakfast ~ smooth Mint. I am fueled and ready to start my day. I forgot my apple for snack if needed, but, have a stash of popcorn, crackers, nuts and lowfat yogurt if needed before Body Sculpt Class at lunch. 3,039 Calories Burned ~ Woohooo!!! I managed to fit it ALL in yesterday as crazy as it was. I realized I need to check off at least one of the big todos (cardio or strength) in the AM with the other at lunchtime because I can meditate and do yoga anytime of the day. It seems like they start you out with small meals and build up to a big dinner ~ which is the opposite of how my body works, but, I AM working it. I am bummed I wasn’t hungry enough to eat my fruit kabob dessert! I LOVED all the food yesterday and look forward to today’s eats too! You can click HERE to see how Angelea’s first day went ~ she seriously rocks getting up at 4:30 AM to get everything in! * FUN QUIZ ALERT! Click HERE to see if you know the 11 most common RUNNING mistakes we make. Be brave and share your total! I got 7/11 and they say I am a running expert – that’s funny! * Click HERE for a cool slide show on 20 ways to burn 200 calories. * Women’s Health put out an intense Fat Frying Workout that you can download to your Ipod – I LOVE workouts on the go. Click HERE to check it out. Last, but, not least, you STILL have time to Join us in Angelea & Danica’s Bikini Bootcamp June Challenge. Sign up for the challenge (email Angelea) and you’re automatically entered for for your chance to win a FREE copy of the Bikini Challenge Bootcamp book! Cut off time for today’s book giveaway is 6pm cst today! See you all after Body Sculpt for a Bikini Bootcamp VEGAN Lunch! 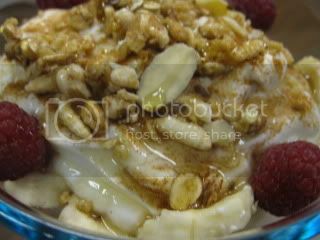 That parfait looks AMAZING!! Way to go with the calorie burning! Have a great Tuesday! as soon as i saw the title for this post i knew it would be overwhelming with deliciousness and i was absolutely right – yummmmmm girl! Mmmmmmmmmmm…. yogurt parfait! Gimmie gimmie! Ok, so I have to know, what is sun salutations yoga? K ~ Thanks to you I am hooked on parfaits even if I have to wait 2 weeks to add a VitaTop. 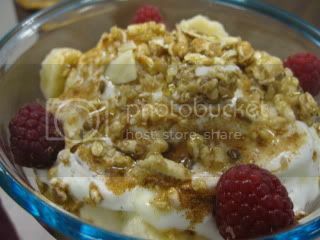 Health ~ I really liked the Kashi – it has a nice, granola like crunchy sweetness. Jess ~ I’ll share it with you – just come on over. I will post the Sun Salutations Yoga Series in my AM post tomorrow for you. Anne ~ Thanks, I LOVE my Body Bugg ~ it completely motivates me as I watch my calories burned go up all day long!